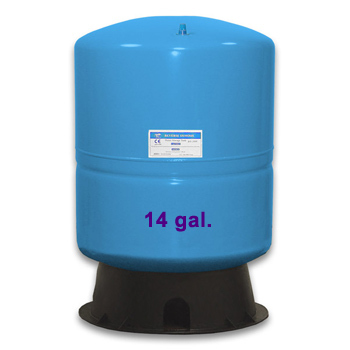 AM-RO-143293 - 1/4" AM-RO-143198 - 3/4"
14 Gallon Storage tank for Reverse Osmosis Water Systems. Pressurized, blue. For residential and light commercial applications. Can be connected to residential and commercial reverse osmosis systems. More than one tank can be used to increase storage capacity. NSF certified to standard 61.